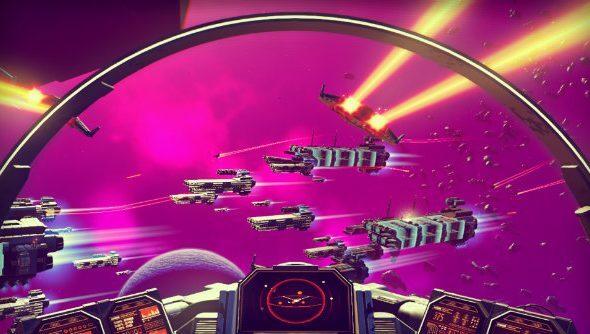 No Man’s Sky is mere days away from release and Hello Games have certainly not been sat on their laurels after sending the game away for certification. Still can’t wait until August 12? Right, get into these excellent space games for PC and we’ll see you in a few. In patch notes for the update due to go live on PC and PS4 this week, Sean Murray has laid out what he envisions as being the first of many free updates expanding and improving the highly awaited game. One of the most important changes in the notes of version 1.03 is that the team has recognised a method one player who got the game early was using to get to the centre of the universe in around 30 hours as an exploit and removed it from the game. Other things the player that used this exploit noted, such as a baffling lack of inventory capacity in your ship itself, have also been addressed by the team, proving good things can come out of pre-release leaks. The patch also adds more content, via increasing the variation and diversity of life that can be generated as well as increasing galaxy sizes by ten times. Space station interiors now have more options, such as bars or hydroponic labs, and more ships are available to the player for purchase. The upgrades don’t stop at launch, either, as Murray said future updates will bring massive gameplay changes such as base building and the ability to own large shipping frigates, too. Here is the complete list of the new features to expect when you get your hands on the game at launch. Beware, there are some minor spoilers, so if you want to go in fresh just know that lots of good stuff has been fixed in this patch.